They are to the Chinese what hot-cross buns are to Christians at Easter, but mooncakes, the salty-sweet confection eaten for centuries during the Mid-Autumn Festival, are getting a modern makeover. Traditional golden-brown mooncakes are made of heavy, sticky lotus-seed paste and contain whole egg-yolks in the middle. Filling traditional versions contain four egg yolks, representing the four phases of the moon. Older variations are also made from red bean and green bean paste. Served warm, they are heavy, laden with calories and at upwards of 300 yuan (US$38.5) for a box of four, not cheap. 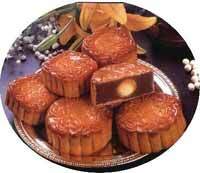 But as tastes and lifestyles have changed in Hong Kong and China the Chinese mainland, so have mooncakes. As Western foods have taken a hold in Asia and people have become more aware of the health risks associated with sweet and fatty foods, mooncake bakers say they have moved away from the stodginess of the traditional treats towards lighter and healthier options. As families prepare to celebrate the Mid-Autumn Festival Tuesday, among the treats they will be digging into will be coffee-flavoured mooncakes by US coffeeshop chain Starbucks and ice-cream versions by Haagen-Dazs. Not wishing to lose out, Hong Kong brand Taipan created the Snowy mooncake, which is white, served cold and stuffed with unusual dainties such as mango, coconut and swallow's nest. Others are filled with ham, assorted nuts, shark fins and even abalone. The world-renowned Peninsular Hotel in Hong Kong has also got in on the act, making its own lighter egg-custard mooncakes that even appeal to Western tastes. Strong annual growth in sales of Taipan's Snowy mooncakes, which it has been selling for 15 years and now produces in 20 varieties, reflects changing tastes. "We launched the cakes because we believed people were tired of the traditional, fatty cakes in the heat of late summer when the festival takes place. 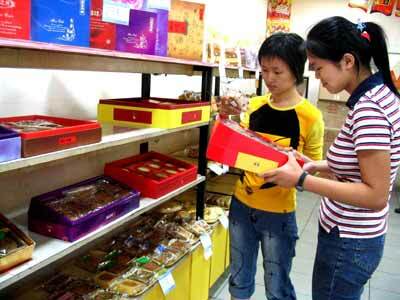 We believed that cold, light moon cakes would be become more popular," said Taipan customer relations officer Bobo Cheung. More traditional bakers followed Taipan's lead and launched their own versions. There are many tales about the significance of the mooncake. Children are told the ancient story of the moon fairy who lived in a crystal palace and came out only to dance on the moon's shadowed surface. Another legend links them to a mythical day when 10 suns appeared at once in the sky. The emperor ordered a famous archer to shoot down the nine extra suns. When the task was accomplished, he was awarded a pill that would make him immortal but it was only eaten by his beautiful wife Chang O. After taking the pill, she floated all the way to the moon and it is said her beauty is greatest on the day of the moon festival that takes place on the 15th day of the eighth lunar month. In the most famous legend, however, mooncakes are used to conceal secret messages sent among Chinese revolutionaries plotting the overthrow of the Mongol invaders in the 14th century. Today, Chinese celebrate the festival, the biggest in the calendar after Chinese New Year, with colourful lanterns. While advocates of the new-style mooncakes claim the traditional confections could be on their way out, their supporters believe there is still plenty of room for growth. Wing Wah, which has made traditional mooncakes for 54 years and sells some 30 varieties, says its traditional lotus seed paste cakes are still a big seller in Hong Kong and account for 60 percent of the company's sales. Company spokesman Lee Ying-kuen, who has been in the bakery industry for 40 years, has seen mooncakes go from being hand-made to produced by machine. As the company strives to improve its recipe, Lee said it has no plans to abandon what he called the "good-old" recipe except to reduce calories. Once made with pork oil, they are now cooked in corn oil and use less sugar, cutting the fat by a third. "Hong Kong people are more health conscious now. We used to think a good mooncake were golden brown and with oil dripping out but if you sell them now, you would certainly put them off," he said.